The EMEE EuroVision Laboratories (EuroVision Lab.s) aim at the implementation of the Change of Perspective (COP), the underlying concept of the EMEE project, into museum practice. 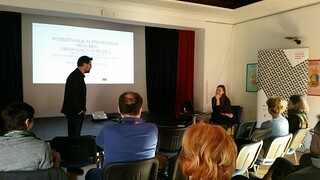 In desire to implement the developed EMEE theoretical outputs into practice, the EMEE-team Ljubljana cooperated with different museums, but also with museum non-visitors in order to establish a genuine relationship between museum experts and public on the base of transnational objects of European cultural heritage. Below follows the concept of the EMEE EuroVision Lab. Ljubljana, a description of its elements and the conclusions and so-called ‘lessons learned’ which evaluate the EuroVision Lab. experiences of the Ljubljana EMEE-team. The EuroVision Lab. Ljubljana was based on all three EMEE’s COPs, EMEE Toolkits and former knowledge about the non-visitors (activity 7). The main idea was to intertwine and really connect these EMEE elements and work on the exemplary unit of EMEE-team Ljubljana. This was done through different relations of work on a level of object, on a level of public and on a level of cooperation between museums. The EMEE-team Ljubljana started a collaboration between the national and regional museums in order to become supporters, instead of competitors and to introduce them to the EMEE principals. 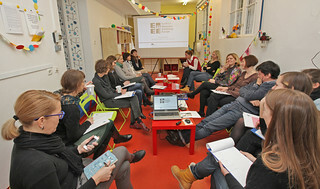 Further on, the connection of the people, who work in museums (museum experts) with the non-visitors’ group was established. Additionally, an activation of the group of non-visitors was ignited – in this case young adults – in exhibition making on the base of important transnational multi-layered objects of involved museums. Travelling part of EuroVision Lab. Ljubljana. In order to assure a rather untypical approach to the EuroVision Lab. 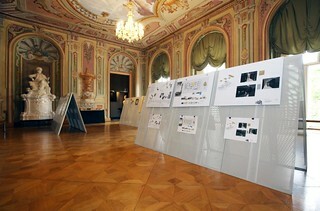 implementation in Ljubljana, EMEE-team Ljubljana – The National Museum of Contemporary History decided to give a lot of emphasis on the pre-Lab. activities. They consisted of both an educational and edutainment part. Starting with educational part, two groups were invited to join a collaboration through the open call: fifteen museum experts from thirteen national and regional museums and fifteen young adults. The decision, which groups to invite was well thought through, and the even number was crucial for the final preliminary event. Museum experts were trained in multi-layered object presentation and in re-interpreting museum objects following the scheme presented in Toolkit 1 and identify European/ transregional aspects/ relations in formerly national interpreted museum objects. The EMEE training consisted also of social arena basis (Toolkit 2) and bridging the gap with the public (Toolkit 3), as well as the usage of scenography in exhibition making (Toolkit 4) and usage of social web (Toolkit 5). Moreover, museum experts provided the pool of transnational and multi-layered objects, following the categories from Toolkit 1, for the next phase – the experimental exhibition. The group of young adults, aged between 18 and 35 years, which has no more schooling obligations towards the museum visiting, represented the largest non-visitor group for the museum, according to the previous EMEE activity 7. By inviting them to the EMEE workshop training (similar to the one museum experts had, however, adopted to the needs of the young), which led further on to participatory exhibition making on the base of the pool of objects, the transformation into visitors and co-workers occurred. 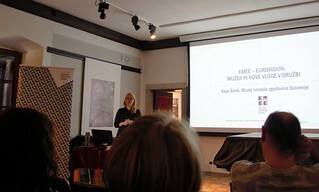 Furthermore, participants became also the messengers of the Museum. This phase concluded with an unusual joined meeting of both groups, the experts and the young on a special event: Museum Speed Dating, which was adopted by the concept of Speed Dating. Both groups were gathered in a one large room, behind a long table – on one side the experts and on the opposite, the young. Museum experts came well prepared, each with their one top multi-layered object – re-interpreted along the eight categories in Toolkit 1 – in order to convince the young, their object is interesting enough to qualify into the exhibition. At the same time, the young were the decision makers, who had to select the five objects, after talking to each and every museum expert from thirteen museums. The joined edutainment event had many goals, besides the democratic selection of five top objects, on base of which the young wanted to prepare an exhibition, fitting to the already existing Exemplary COP-Unit from the museum. One of the goals was for the museum experts to step out of their comfort zone and meet the public (which they rarely do) and perform a goal-oriented discussion with the young, one-on-one. Being limited in time, they also had to select the information they wish to share with the young skilfully, which is again a quite demanding task for the curators in general. On the other side, the COP 2: Change of Perspective as role modification between museum experts and visitors through activation and participation, was consistently implemented through this game. The young were able to meet the people who work in the museums in person (not only the receptors when visiting) and through the emotional situation develop a bond with the curators. They were also empowered with the role of being the decision makers and the curators – a turn, which happens extremely rarely in the museum world. Intervention of young local artists on the subject of inviting the non-visitors to the museum. The participatory experiment with five selected objects and the Exemplary COP-Unit Fiat 600 – Zastava 600/ 750 – fičo was conducted in tight cooperation with the young. In this element of the EuroVision Lab. Ljubljana, the museum tried to integrate everyday issues, relevant to the participatory group in the realms of the museum in order to help to establish the museum as a place for discussion and active participation for the young (museum as a Social Arena). Through tuning in with the focus group, the participation regarding the arrangement of exhibition contents and museum representations was established (Bridging the gap). Therefore, a stronger involvement and a more active participation of the visitor in the exhibition activities occurred. With the support of the museum, they prepared a concept of a Time Capsule, a very interactive and tactile exhibition, which finally followed their desires: interesting and enabling exploration; as little text as possible ; user friendly and comfortable; educational, yet fun. To achieve all the desires, they worked tightly with the involved museums, with the EMEE-team Ljubljana, with people, who shared their stories, memories and photos in the complementary photo contest of the fičo, and their peers. They had to go through all the stages of exhibition work, the curators usually do, including the collaboration with the designer, preparation of the catalogue, promotion of the exhibition, media interviews and preparation and performance of the complementary programme. In this way, another goal was reached – transforming the museum into a space that offers a platform for learning about the heritage and gaining the experiences, through which the level of responsibility towards the joined European heritage is increasing among the public. Before and after: the participatory exhibition Time Capsule done with the young adults, 1st photo: June 2015, Janja Štefanič; 2nd photo: July 2015, Sašo Kovačič. Additionally, to introduce the important transnational heritage to the public in a more personal way, to show the pool of objects and the EMEE objects the museums resembled to, an exhibition Museums – The Creative Laboratories was performed, where all the involved museums and the EMEE partners were presented with their selected transnational objects. The persons as ‘guardians’ of the objects were shown on purpose, to enable the users of the exhibition to sense the personal touch behind the usually non-personal exhibitions, and in this way, to create a step towards bridging of the gap between the museums and the public. An interactive game EuroBarometer was a vital part, where the visitors were able to decide, in which objects they see the Europe. EuroBarometer was a simple computer game, consisting of all the exhibited EMEE objects, asking the visitors, in a fun way, which object they find the most European. At the same time, it motivated them to seek more information about the objects in the game that were available in the exhibition. The game was designed to travel to the other two EMEE museum partners to collect the international data in the end and gain the most European EMEE object, according to the vote of visitors. Including the travelling exhibition, resulting The EMEE Young Scenographers Contest was a perfect supplement to both of the exhibitions, since it represented additional exhibiting possibilities of EMEE Exemplary COP-Units, proposed by the young from all over Europe. An EMEE international, interdisciplinary design competition invited young designers to create ideas and develop design concepts for a multi-perspective, synaesthetic presentation of museum objects within the theme ‘One Object – Many Visions – EuroVisions’. Through this the goal to find new transcultural approaches to present regional (local) objects in a European (global) dimension via contemporary, content consistent exhibition design and new formats of presentation was reassured as a complementary visualisation of the proposed usage of the scenographic tools in museums (Toolkit 4). To round this phase, the Museum invited the local young artists to tackle together with the question of inviting the non-visitors to the museum after the example proposed in EMEE workshop: Change of Perspective by involvement of new audiences and artists. After getting familiar with the EMEE concepts, an illusionistic outdoor intervention was made, inviting the museum by-passers to the EuroVision Lab. The pink stairs seem to have the visual effect also outside the physical museum world, since they became one of the most published post on Instagram by the Instagram users, right next to the EMEE-team Ljubljana’s exhibited exemplary unit – fičo. This is a visible change for the Museum, who rarely appeared on Instagram by the users, before the implementation of the EuroVision Lab. With the knowledge, the accomplished exhibition is just the beginning; the young prepared a rich complementary programme, which they also performed. To motivate the younger generations to visit, they created the EuroVision Lab. treasure hunt using the six exhibited objects in the Time Capsule. They prepared a series of guided tours with talks on Sundays, as well as specific children’s programme with creative workshops. Since the exhibition was enabling the visitors to touch the objects and explore them fully, the volunteers from the hearing impaired association proposed the collaboration. Therefore, the hearing-impaired young adults prepared special events titled ‘What is Europe to me?’ with guided tours in the sign language and one specifically for the blind-deaf people. The fill-rouge through the entire EuroVision Lab. was establishing the relationship with the museum as an institution and the public, particularly the young, using the power of the transnational multi-layered objects. To conclude the Lab. in this way, a series of three evening museum tea parties was designed. The purpose was to create a cosy and pleasant atmosphere in the museum, where two target groups – museum experts and young adults (interested in museums) – could easily interact and debate on the EMEE topics about the current museum challenges. According to Toolkit 2: Integrating multicultural Europe. Museums as Social Arenas, museums should enable the public to discuss on the relevant issues in a friendly and safe space, created by the museum. Museum tried to offer continuous organized activities in which unknown people from different backgrounds interacted in order to debate and establish social relationships. Inviting the local and international guests, worked as a motivation to increase the dialog between the museum experts and the public. This type of events was chosen instead of performing the scientific symposium, since symposiums represent an established practice in museum, whereas tea parties are not a common practice, enabling the new experiences for the guests and the participants in the spirit of edutainment. A part of the EuroVision Lab. – Museums – The Creative Laboratories – was designed in a travel friendly form, proposing the participating museums to host the exhibition, enriched by their objects in situ with additional elaboration and indebt multi-layered presentation. The proposal was brought to life in three of the involved museums, members of EMEE working group: Museum of Recent History Celje, Gorica Museum and Posavje Museum Brežice. In two of the museums also EMEE talk and EMEE workshops for the hosting and the surrounding regional museums’ staff were performed. The idea behind the travelling is to strengthen the EMEE COP’s with the knowledge from the EMEE workshops among the national and regional museums and their staff, as well as among the visitors of those exhibitions. Particularly, COP 3: change of perspective in the process of international cooperation was strengthened through the networking of the involved thirteen museums and through the travelling exhibition, hosted in the three mentioned museums. Through this, the EMEE concepts are more likely to become interconnected and intertwined in the work of European museums. The aim of the EuroVision Lab. Ljubljana was to look at museum objects held in the National Museum of Contemporary History, the ones held in national and regional museums in a new way – offering a European re-interpretation. Second and third aims were to change the traditional roles with visitors, and to strengthen the museum network. Through these three aims, which perfectly correlate to the EMEE COPs, the Museum intertwined the EMEE principles and created a fresh museum experiment, which completely differed from the typical and established work. The EuroVision Lab. Ljubljana firstly offered the Museum a first step towards bridging the gap with an insight on desires and needs of the non-visitors for the museums. Through working with this population and young artists, it taught the EMEE-team Ljubljana, how to approach the young adults and what they need in a return – experiences, a safe space, a place where they can grow intellectually, and have fun at the same time. The young wish to see behind the scenes of the museum as an institution and to meet the people who work there. They wish museums to be more personal, welcoming and responsive to the major current events in the society, alive through enabling the visitors to be active. The participatory process was full of ups and small downs, with many demanding challenges and rather time consuming, however deeply rewarding. 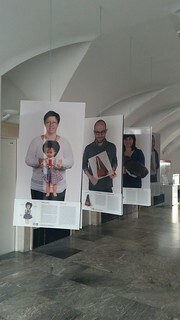 EMEE-team Ljubljana has managed to create an exhibition that was completely different from the type of work Museum did until now. It also had a snowball effect, since the participating young were a sort of Museum’s messengers, inviting their friends, colleagues, peers to the exhibitions and paving Museum’s largest non-visitor group the way to the Museum. The success is visible also in the increased museum visit during the EuroVision Lab., when comparing the visitor numbers with the same period from the year before. In this regard, it helped the Museum to bridge the gap it had with a part of a very important group of people and present the Museum in a more personal way. Additionally, not only the Museum and museum staff were bridging the gap, but all the participant museums and the experts, who worked with the EMEE-team Ljubljana, did it as well. It also enabled the EMEE-team Ljubljana to work firmly and tightly with their members of working group – national and regional museums, sharing ideas and good practice examples, instead of competing for the attention of the public. Through the process they realized, how difficult it is to change the already established way of presenting the objects through one, usually nationally preferred layer. It took the EMEE-team Ljubljana a while to turn the old and established ways and convince the participating museum experts in using the multi-layered and transnational interpretations of their most important museum objects, which almost always had exactly that – European or even more transnational background, history and story(ies). a question of nurturing the established relationship after the EMEE project. The EuroVision Lab. Ljubljana made the EMEE-team Ljubljana look on the objects in their collection in a different point of view (COP 1) and see the need of switching the roles between the museum and the public (COP 2). On top of that, the Museum strengthened the network with the museums, who became more willing to cooperate in the future as well, with one fourth of all registered museums in Slovenia already cooperating with the Museum after the EuroVision Lab. (COP 3). The changes, EMEE project caused, especially with the implementation of the EuroVision Lab., have occurred on the internal Museum level, and on the external one. All in all, EuroVision Lab. 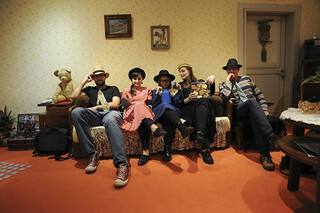 being successfully performed and extremely well accepted by the public and the media has an encouraging effect not only on EMEE-team Ljubljana, to continue working in this way, embedding the EMEE concepts in the following museum work, which they have already included in their Museum’s mission and vision. It also left some effect on the participating young adults, who regularly return to the Museum, and it rooted the new way of presenting the objects among the EMEE network of the museum. Additionally, the last effect has the potential to continue after the EMEE project is concluded – the travelling part of the EuroVision Lab. is offered to travel to the rest of the involved museums and spread the transnational and multi-layered object presentation among the museums and public. According to the inquiry and demand for EMEE workshop performances among the Slovene regional museums, this is also the plan for the future, which may go on, even when EMEE project is finished.